Doors & bar open 2.15 pm. Tickets are £8, or £5 for 16 years and under. Available from Staindrop Post Office or online from Ticketsource. 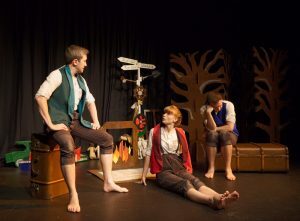 This classic tale is for all ages (children from 7 years upwards) - with a fresh twist from the fabulous Castle Players. NEW Flower-arranging course with Kathryn Hume of Forget-me-not Flower Design and Flower School. Learn something new each week with expert support and tuition from Kathryn. The 10 x session course (each session lasts 2 hours) starts on Wednesday 31 January with the last session on Wednesday 6 June. The cost is only £85 which includes use of tools, week 1 flowers, and all oasis. He has recently joined Frank Skinner’s Absolute Radio Show and can be heard every Saturday morning from 8am. 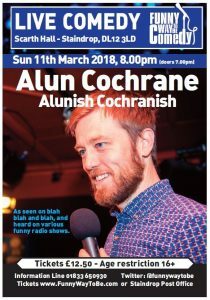 Alun has several television appearances to his name, most recently Michael McIntyre’s Comedy Roadshow he’s also often seen on Eight out of ten cats, Mock The Week, and has appeared on Soccer A.M and Live At The Comedy Store. Radio producers are also aware of Cochrane’s talent and he’s notched up various credits from Just A Minute, 4 Stands Up, and The Now Show to Clive Anderson’s Chat Room. Grumpy-joyful, silly-serious stand-up. Jokes, ideas and (possibly) movement will all be deployed for your amusement during this show. Tickets from Staindrop Post Office or online from Ticketsource. Doors and bar 7.00 pm, show starts 8.00 pm. Tickets available from TicketSource or from Staindrop Post Office. A chance to see this lovely film starring everyone's favourite bear, with Paddington 2 showing on Friday 25 May. Snacks and light refreshments will be available. Scarth Hall has partnered with Northumberland Cheese and Teesdale Cheesemakers to create a wonderful Cheese & Wine event! As well as artisan cheeses there'll be fine wines (and other drinks via the Scarth Hall bar) and home-baked bread to savour. Test your tastebuds with quizzes, mystery tasting, and games. Times and ticket details to be confirmed. A chance to see this lovely film starring everyone's favourite bear, with the first Paddington film  showing on Friday 11 May. Snacks and light refreshments will be available. Afternoon 12.00 - 5.00; Evening 7.00 - 11.30Scarth Hall, Staindropscarthhalltickets@gmail.com£7.50 afternoon or evening, includes welcome G & T, nibbles and snacks. Free mocktail for all those with a ticket for the afternoon session! Staindrop Gin Festival showcases over 23 gins (supplied by Durham Ginstitute) with recommended tonics and garnishes for each one. There's a selection of cocktails (mocktails too!) and a fully-licensed bar. Enjoy a relaxed ambience with a great soundtrack and live music at the evening session. Only £7.50 for either the afternoon session or the Evening session, includes a welcome gin & tonic, nibbles and snacks. FREE MOCKTAIL for everyone with an advance ticket (not pay on the door) for the AFTERNOON session. Tickets from Staindrop Post Office or ticketsource.co.uk. This is a volunteer-run event and all proceeds go towards the upkeep of the village hall. The Greatest Showman - sing along! Doors and bar 6.15 pm, show starts 7.00 pm. 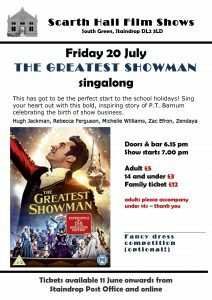 Come along and just enjoy the film -- or sing your heart out! What better way to start the summer holidays? A chance to see this very popular and talented north-east singer-songwriter. Not to be missed! Eight-piece horn-driven R n B, Stax/ Atlantic soul and originals – see the band biography for more details. Tickets £10 from Staindrop Post Office and online. Doors & bar 7.00 pm. A chance to see this fantastic swing jazz quartet following their sellout success at Scarth Hall in July 2017. Come to a music and social evening and listen with other music-lovers to records played through a top-notch hifi system. If you still have a record collection, why not bring a couple of favourite albums and share them? It doesn't matter if you don't have any records - come along. Free entry. The bar will be open with fine wines and whiskeys in stock especially for this evening, along with hot and cold soft drinks. After the success of our first Cheese and Wine event in May 2018 we have put a little more emphasis on wine for the November event! 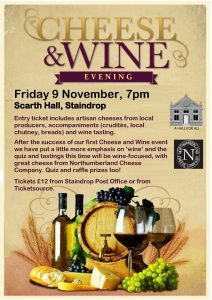 The quiz and tastings this time will be wine-focused, with great cheese from Northumberland Cheese Company. There are quiz and raffle prizes too! Entry ticket includes artisan cheeses from local producers, accompaniments (crudités, local chutney, breads) and wine tasting. Tickets £12 from Staindrop Post Office or from Ticketsource. Discount for a purchase of 10 tickets (£110 instead of £120). All proceeds go towards the running costs of Scarth Hall - many thanks for your support. Presented by the Box Tale Soup theatre company, this is a beautiful new adaptation of Kenneth Grahame's much-loved classic. It features unique handmade fabric puppets and a charming original score. Doors & bar 6.30 pm, tickets £3/£5/£12 available from Ticketsource now, and from Staindrop Post Office.